It's often claimed that 3-D printing – known in the trade as "additive manufacturing" – will change the way we live. Most recently, a team from Eindhoven University of Technology announced plans to build the "world's first" habitable 3-D printed houses. 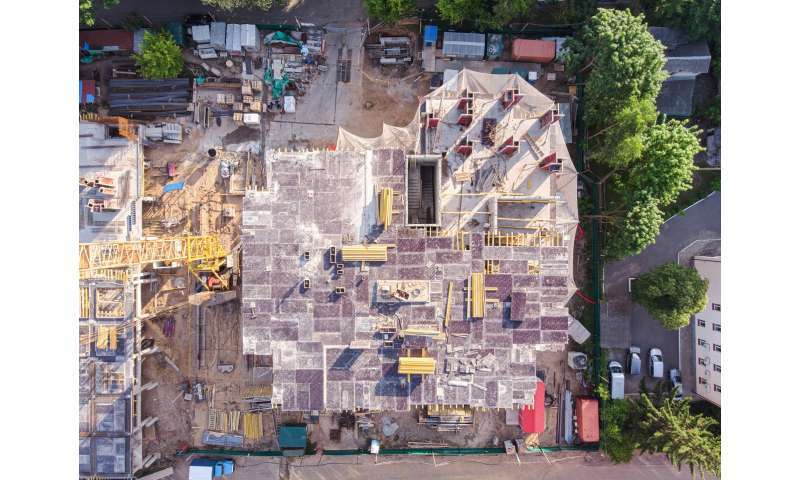 But it's one thing to build small, prototype homes in a park – it's quite another to successfully use additive manufacturing for large scale projects in the construction sector. Additive manufacturing uses a combination of materials science, architecture and design, computation and robotics. Yet in some ways, it's not as futuristic as it sounds. The simple approach of layer-wise construction – where building materials are layered on top of each other to create a facade – has already been practised for a long time in the construction sector, for example in conventional brick layering techniques. 3-D printing can produce up to 30% less material waste, use less energy and fewer resources, enable in-situ production (which in turn cuts transport costs), grant greater architectural freedom and generate fewer CO₂ emissions over the entire lifecycle of the product. One component is printable feedstocks – the materials which are actually "printed" to create the final product. There are many types of printable feedstock, but the most relevant one for large scale construction is concrete. Printable feedstocks are typically made from a combination of bulk materials – such as soil, sand, crushed stone, clay and recycled materials – mixed with a binder such as Portland cement, fly ash or polymers, as well as other additives and chemical agents to allow the concrete to set faster and maintain its shape, so that the layers can be deposited rapidly. In a project I am currently working on at Brunel University, we are focusing on producing a printable cement feedstock. To create materials for 3-D printed constructions, scientists must carefully control the setting time of the paste, the stability of first few layers and the bonding between the layers. The behaviour of the materials must be thoroughly investigated under a range of conditions, to achieve a robust structure which can take load. The combination of cement, sand and other additives must be just right, so that the feedstocks don't set while still in the printer, and don't stay wet for too long once they have been deposited to form a structure. Different grades of feedstock need to be formulated and developed, so that this technology can be used to build a range of different structural elements, such as load-bearing and large-scale building blocks. The geometry of the structures produced is the final piece of the puzzle, when it comes to using 3-D printing in construction. When the printer and the feedstock have been properly set up, they will be able to produce full-size building blocks with a smart geometry which can take load without reinforcements. The shape stability of the truss-like filaments in these blocks is an essential part of printing, which provides strength and stiffness to the printed objects. This three-pronged approach to adapting additive manufacturing for construction could revolutionise the industry within the next ten to 15 years. But before that can happen, scientists need to fine tune the mix ratios for the feedstocks, and refine a printing system which can cope with the rapid manufacturing of building blocks. Only then can the potential of 3-D printing be harnessed to build faster, and more sustainably, than ever before.